Buying: SaddleBack Equestrian can help find your next dream horse whether a seasoned show horse, an up and coming prospect, or pleasure horse. Their expertise and network of trainers, equine facilities, and social media can help help "weed out" the multitude of possibilities on online sites. This saves time and expense of travel and trying horses by narrowing down options to those on the market that best fit the rider's needs. SaddleBack can also arrange the pre-purchase examination, shipping if needed, and more. Leasing: Sometimes leasing can be a better option than buying for riders' current situation. Leasing has advantages for many riders--especially show riders looking to move up, riders about to graduate and head off to college, and more. SaddleBack Equestrian has a large network of top lease horses and contacts across the nation, as well as expertise in leases--including contracts, PPE, insurance, etc. Sales support: If you prefer not to deal with the hassle of advertising, filtering between window shoppers vs serious buyers, spending time answering numerous questions, and meeting with potential buyers, then SaddleBack can handle all that for you! They can provide quality marketing and exposure to a network of other trainers, equine facilities, and potential buyers seeking horses. This includes their professional equine industry network, social media, and other marketing efforts that an individual seller may not be able to provide. When you find yourself in the need of assistance in buying or selling your horse, give SaddleBack a call to discuss how they can help. SaddleBack has a selection of trained horses and quality prospects available for sale and lease. Even if they don’t have anything for you currently listed, they can assist in finding your perfect match. Give them a call today to see how they can help! 2011 Oldenburg Mare, Stunning Junior Hunter; Won Champion at last 2018 show. Earned Blues in Under Saddle every show in 2018! Stunning Small Junior Hunter !!! 2011 - 15.2 hh Oldenburg Mare (reg. CSHA). Journey is a fabulous mover by Sir Gregory. 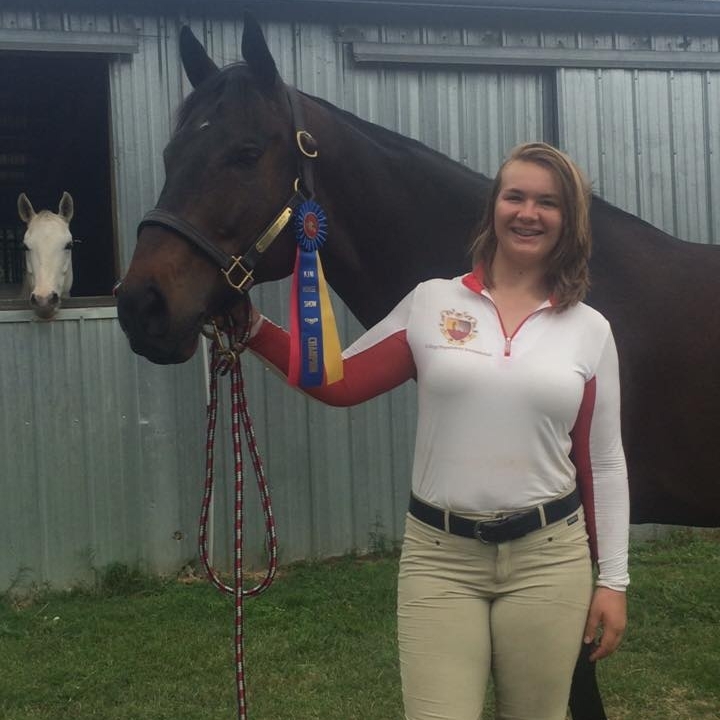 Only backed in January 2016, the same year she finished FIRST overall in the Central East Zone Hack Division being ridden by an amateur older para-adult, and was 2016 Zone Champion and Top Junior Hunter Prospect. She's now 2 years over fences and is easily jumping 2'6"-3’ courses with fill. Schooled 3’9 gymnastics at home. She has TONS of scope and a HUGE step. She has a very balanced canter and easy lead change. SHE WINS THE HACK! Goes barefoot and easy keeper. She is very friendly - completely in your pocket! SaddleBack S&L purchased her in December 2016 as a fancy lease horse while continuing her training as a hunter. Still Green Eligible! For Sale: $25k, or Lease: $8.5k/year. Discounted lease available for leasing at SaddleBack. CONTACT SaddleBack (contact info at end of video is previous owner). Reeses Pieces (aka Reeses) is a sorrel roan Appaloosa, registered "Margarita Scotch" with the Appaloosa Horse Club, 15’3 hh. She’s been a top lesson horse at SaddleBack Equestrian for past 2 ½ years. Taught many youngsters & adults how to ride, learn to canter & jump as well as been a favorite at summer camps. Never a spook, buck or bolt. Truly bombproof!! Done everything from breed shows, dressage, hunter jumper shows, parades, drill team & more. Anyone can ride her--kid-safe & “husband-safe.” Same horse whether ridden daily or lots of time off. No prep, lunging ever! When we purchased her she’d been in a sweet family’s backyard & hadn’t been ridden in a few months. Came to SaddleBack & started teaching beginner lessons the very next day. Healthy, sound & up-to-date on everything (Coggins, Annuals Vacs, teeth, etc). Barefoot & great feet. No health issues we know of & none since we’ve owned her. Not mare-ish. Only selling so she can work less as she’s getting older, but she’s not ready to retire, has years left and likes to work. Loads, clips, everything great. A true babysitter both on the ground and on her back. Approved home only! Video of her jumping 18”-2’ course (has lead changes, this video shows both simple & flying). “Quantum Leap” aka Karma is a 10 year old, 16’1hh, Thoroughbred Gelding. Proven .85/Puddle Jumper Champion, 2'6+ Intermediate/Modified Hunter competitor, successful .95 Jumper & potential for much more! Jumps 3'6 w/ease at home! Does not care about jump & will help at beginner level height! No spook or buck. Points earned in already for 2016 in .85 jumpers, TB 2’6 Hunters and Thoroughbred Jumpers 2'6+--Jockey Club Thoroughbred Incentive Program, OHJA and HJEO. 2015 OHJA Year End Awards: 7th Place Puddle Jumpers. Health History: Up to date on all Vaccinations (Coggins, Annuals, etc done March 2016); No Health issues – easy keeper; No routine medication; bare foot since 2014—great feet! Bathes, loads & hauls easy for shows, stands for farrier; NO Spook! Purchased April 2012; Lived at Hunter/Jumper barn since purchase; Been in training program and ridden & shown regularly since purchase; best fit w/advanced beginner or intermediate rider due to forward ride over fences (quiet on flat). Priced for Quick Sale! Rider moved up to Children/Junior Hunter type before college. Contact: 918-408-6446. Call, text or email for more info. Vanteca is a 2005 Friesian x Andalusian x Gelding (1/2 Friesian x 1/4 Andalusian). Double-registered with both the Friesian Sport Horse and the Friesian Blood Horse Registries. An outstanding mover with beautiful self-carriage, long sweeping reaching legs at the trot, and rounded at the canter. Won a silver medal at his Keuring (Friesian Blood Horse Registry) as an 18 month old scoring an 8.0 in overall impression and development. Vanteca was professionally started and is extremely well broke. Kind and quiet - never a buck or a bolt – would put a beginner on him! Works hard and always wants to please. He has an awesome trot!!! He is dressage, through and through. Ready to be shown in Training Level Dressage and quickly move up through the levels. Knows his leads, leg yields, half passes, extends, moves off and around your leg nicely, works in a lovely frame, and has performed flying lead changes when asked. Vanteca would also make an excellent all-around horse for the dressage, combined training, eventing, driving, fox hunting or just pleasure rider who loves riding a beautiful horse! Gorgeous head and neck! Currently 15’3hh and still growing. Should mature to 16 hh+. Excellent large Friesian feet (no shoes). No vices. Impeccable ground manners. Great for the vet and farrier, hops up in the trailer every time excited to be going somewhere, and is up to date on coggins, shots, etc. Selling due to owner changed disciplines to Reining. Vanteca was the last colt out of Vanyel a purebred son of the Dutch qualified stallion, Laes. In his first year showing in hand at the recognized dressage shows Vanyel consistently scored in the upper 60's to mid 70's. In 2002 he was UNDEFEATED in Aged Stallions.